Invasive species—those nonnative organisms that aggressively spread into the landscape—are widely recognized as major threats to biological diversity, second only to direct habitat loss. 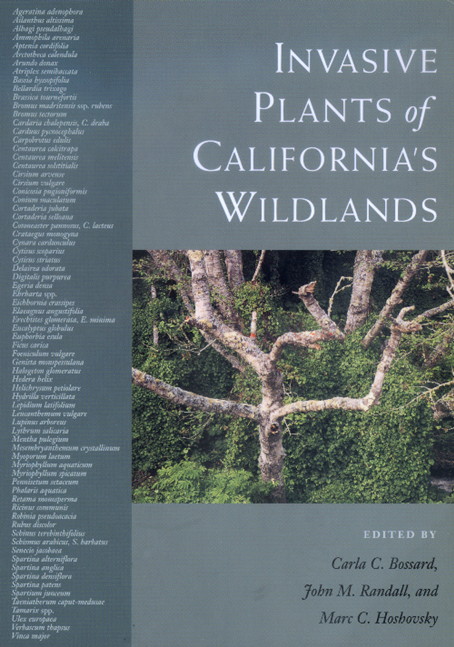 This book provides specific information about the biology and control of the 78 nonnative plant species that are listed by the California Exotic Pest Plant Council (CalEPPC) as being of greatest ecological concern in California. The heart of the book consists of species accounts, each description illustrated with a close-up photo, a habitat photo, and line drawings showing details to aid identification. The text addresses the following questions about each speices: How do I recognize it? Where would I find it? Where did it come from and how does it spread? What problems does it cause? How does it grow and reproduce? How can I get rid of it? This book was inadvertently printed without a common-name index. To see the index, please click the "Errata" link above. Carla C. Bossard is Associate Professor of Biology at St. Mary's College of California. John M. Randall is Director of the Wildland Invasive Species Program at The Nature Conservancy and coeditor of Invasive Plants: Weeds of the Global Garden (1996). Marc C. Hoshovsky is Senior Conservation Biologist at California Department of Fish and Game.